Downrigging has its own special demands, and this reel surpasses them. The quick 4.3:1 gear ratio allows you to clear lines quicker, keep up with speeding fish easier, and work lures better. Additional features include: ball bearing drive, titanium drag system and, strong lightweight 1-piece graphite titanium construction. Non-corrosive stainless steel main and pinion gears. "This series reel is inexpensive but I would put it up against any reel (at any price) in its line class for operational durabillity. I have used 4 of these reels for five hard years of fishing wrecks for blackfish and both jigging and live lining for stripers and blues." "This is my first round baitcast reel for saltwater. Very Smooth casting. Smooth retrieve. Only one birds nest on the first cast. I put 30# Red Cajun Line on the reel and it holds up great to 30-40# fish. 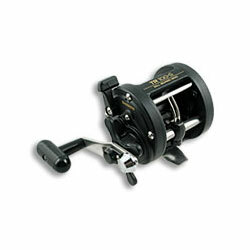 I would recommend this reel to anyone, no matter the skill level."